On January 30, Alyssa Thomas narrowly missed out on a triple-double, finishing with 22 points, 11 rebounds and nine assists in 37 minutes of action as USK Praha defeated UMMC Ekaterinburg in EuroLeague action. In 11 EuroLeague games, the forward is averaging 18.6 points and 10.1 rebounds. In Czech League contests, Thomas is averaging 16.7 points and 8.3 rebounds to go along with 3.9 assists. On February 2, she had 17 points, seven assists and three rebounds in just 17 minutes in a 122-42 win over BLK Praha. 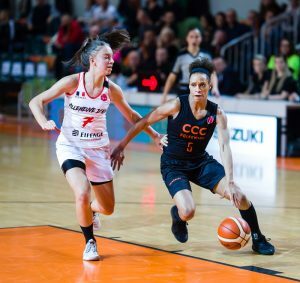 In Poland, Jasmine Thomas is averaging 9.8 points, 3.6 rebounds and 2.7 assists in 11 EuroLeague games for CCC Polkowice and 8.2 points, 5.6 assists and 3.8 rebounds in 14 Polish League games. On January 30, the Sun guard had 16 points, seven assists and four rebounds in a 86-66 EuroLeague victory over Villeneuve. In Russia, Brionna Jones is leading Nadezhda Orenburg in EuroLeague play at 15.1 points and 11.2 rebounds in 13 games. On January 30, she had 15 points and 11 rebounds in a 85-56 win over Castors Braine. The forward is also averaging a double-double with 15.5 points and 10.3 rebounds in 11 Russian League contests. Also in Russia, Jonquel Jones is averaging 16.3 points and 5.7 rebounds in three Russian League games for UMMC Ekaterinburg. On February 3, she had 16 points, six rebounds and two assists in a 87-48 victory over Spartak Moscow Region. In France, Bria Holmes is averaging 8.7 points, 2.5 rebounds and 2.0 assists in six games for Bretagne Basket. On January 26, the guard had six points, four rebounds and three assists in a 83-55 loss to Bourges Basket. In Spain, Rachel Banham has seen action in three games for Gernika Bizkaia, averaging 11.3 points and 1.0 assist. On February 2, she had 13 points, three assists and two steals in a 75-49 win over Zamarat. In Hungary, Lexie Brown is averaging 13.8 points, 3.0 rebounds and 2.5 assists in six EuroCup games for UNI Gyor and 16.0 points, 3.1 assists and 3.0 rebounds in 16 Hungarian League games. On February 2, the guard had 17 points, six steals, three assists and two rebounds in a 91-86 win over Cegledi EKK.